I spent part of the day today setting up the new shop. I'm really having to re-think how I have things set up. At my last house I basically had unlimited space to work with. I sold off all of my big tools before the move. I'll re-aquire some of things I need as I need them. I just need to figure out where they'll go first. Power is big thing I'm dealing with currently. Right now, I've only got one 15 amp circuit available to me with no room left in the panel. I can make it work if I get another 20 amp circuit. Looks like a call to the electrician is in my future. Here's a couple pictures of what I'm working with now. Clearly I have a ways to go in my setup. I'm thinking about setting up a temporary paint area in a free room in the house since I really don't have any available horizontal surfaces to use in the garage yet. 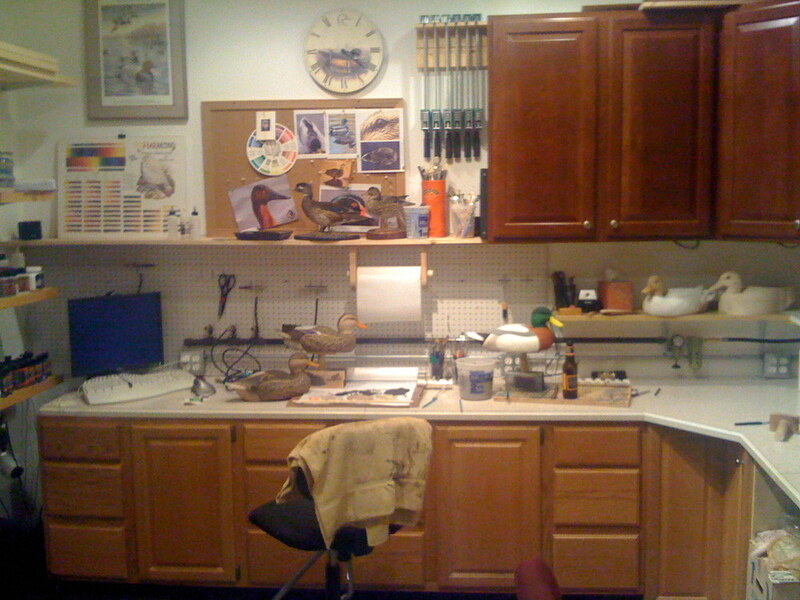 Here's a pretty unvarnished shot of the painting area of my workshop. It's a little cleaner than usual because I vacuumed today. It was at the point where I was tracking wood-chips all over the basement so I thought it was about time to clean up a little. I snapped this picture as I was finishing up for the night on Saturday. I'm currently painting a three bird rig of mallards for a show coming up this summer. The quality isn't so great becuase it's just a snap from my iPhone, but I wanted to show it un-staged. I'll snap some better quality shots of the different areas of the workshop at a later date. These are going to be detailed gunning birds. I spend a little more time painting than you might when you are painting an entire hunting spread. These are for competition though, so I like spending some extra time making them look a little better. Over to the right, you can see a couple more mallards that I'm going to do in an IWCA style. The hen is carved and primed, but the drake has a way to go still. the head is about 80% complete. I just need to add the glass eyes. The body is only roughed out and needs quite a bit of work still.